Shown are voter advocates and sponsors involved in a panel discussion. As Election Day draws nearer (Nov. 6), more than 20 million early votes have been cast so far across the nation, according to media reports. In the town of San Benito it is hard to say yet, but several organizations have been leading the way in terms of registering people to vote and now getting those registered to vote. 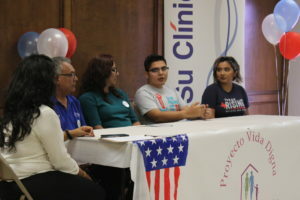 Proyecto Vida Digna, Su Clinica, Unidos US, and Texas Rising held panel and phone bank called “The Power of 18,” aimed at discussing the Latino vote and celebrating the four organizations’ accomplishments. Proyecto Vida Digna is a non-profit based in San Benito while Su Clinica is a health-service provider based in Harlingen, making San Benito a perfect spot to host this celebration. Texas Rising is a state non-profit focusing on the UTRGV and youth outreach while UnidosUS is the largest national Latino civil rights organization in the United States. All four organizations worked together on registering voters and focused their efforts along the Texas-Mexico border this election season, each organization hitting its specific demographics. “We have this narrative in the media of Latino voters being apathetic voters. But I think that narrative is misguided because it doesn’t take into consideration all the real ground efforts that are happening here all the time, not just during election season,” said Texas Rising regional field coordinator Ofelia Alonso. The accomplishments they celebrated include having registered 10,000 voters in the state of Texas this year alone, a majority of them along the Texas border and around 5,000 in the Rio Grande Valley according to Alonso. After the panel, members of the coalition remained in the building to host a phone bank where members made calls to registered voters, urging them to go out and vote. “We want the narrative to be that there are people that are really leading these efforts and that Latino voters are not apathetic because they don’t care but because nobody is talking to them. We don’t see candidates that are coming to talk to them. In the terms of youth voters, that is also the case. They feel that they are not being considered, no one is talking to them, and people around them discourage them,” said Alonso. “But now they’re excited. Now they’re looking at things in a way that they’ve never looked at before. And now our mission is to actually get them to vote,” she said.